I would hate to be a ref in modern sport. I truly do feel for them. The continual lambasting they receive in the media every week should put anybody off wanting to even consider being one. I cannot find any upside to becoming a ref, even though the pay isn’t bad. The reason I am writing this is because this week I finally realised that adults blaming the referee is rubbing off on the junior players of sport in our country. In the last few weeks I have watched netball, soccer, hockey and rugby, from u10 to 1st team and after nearly every match I have heard one of the kids or several parents blaming the ref. The attitude of the general sporting world towards referees is making me ill. It is getting out of control and it is worrying when you hear a 10 year old boy say that they “lost that game because the ref cheated for the other team”. Do parents and coaches expect their kids to win every game they play? Do the kids not get taught how to lose with their heads held high? Is winning everything? Have we commercialised games so much that children aren’t playing for the enjoyment anymore, but to become a superstar? 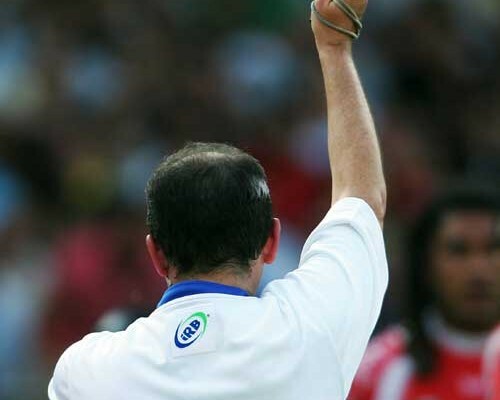 From school sport to the test arenas there is barely a match that goes by where certain members of the losing side, their supporters or coaches, won’t find a way to put blame on the ref. Often they are very vocal with the abuse. Usually it is nothing more than a filthy look, a refused handshake, a comment made from a camping chair on the halfway line, in earshot of the ref. It might even be a remark on facebook or twitter. I have seen U13 kids walk off a field with their heads slung low without acknowledging their team mates, opposition or the ref. UNACCEPTABLE! It is more and more common to see parents shouting at the ref from the side line. Letting him know it was a forward pass or off sides, or high tackle. I am so fed up of parents who think they know the laws of these sports better than the people who have done extensive courses and exams to be refereeing at a particular level, in their chosen sport. 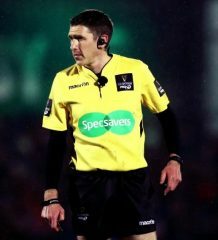 Comments like “agghh c’mon ref are you f@#$£ng blind, that was clearly a high tekkle” when the play was perfectly legal, are not only idiotic but also embarrassing. If my mother or father had acted like that on the side line, I think it would have put me right off all the sports I loved to play. Yes, referees do make mistakes. I think they are allowed to make a few mistakes in the match. Look at the amount of decisions they have to make. If they didn’t bugger a few up, they would not be human. If you blame your loss on 2 or 3 odd calls out of over 100, then maybe you shouldn’t be involved. 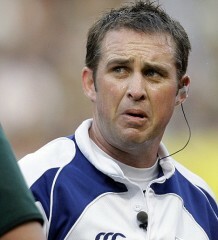 South Africans are famous for blaming refs, especially rugby, the most famous being Bryce Lawrence in the world cup. Vast amounts of our society blamed him, even though the Boks had 80% possession of the ball and still lost. All because of a couple of refereeing mistakes? Then last year a school boy Knocked a Blue Bulls Referees Association ref out. Assault is definitely an extreme, but the comments made by the kid to the ref are astounding. The Ref Chris de Beer said “Die seun het my voor die bors gegryp en vir my gese ek het lekker kak geblaas en my met die kop teen die wang geslaan” The kid was only banned for the remainder of the season. We are not alone in blaming refs. During the 2013 Six Nations, England lost 30-3 to Wales and many people were blaming referee, Steve Walsh. The main being the England forwards coach! If your scrum is getting shoved backwards, can you really blame the ref? Does the public really think these society refs give up their time for amateur sportsmen and women, to pick a side and make them win? It’s pretty obvious to me that refs are scapegoats for sore losers. Let us say these people are right. Are there biased, feckless, incompetent referees in charge of every game? If fans, coaches and players honestly feel that the ref is so influential, then what is the point of playing, supporting or coaching your chosen sport. If most of your losses are put down to the ref, then there is no point celebrating any of your victories, because they are obviously caused by the ref penalising the opposition. It was never your amazing shot at goal, the well executed pass, or the try your prop scored from his own 10 yard line. Nothing annoys me more than the blaming of officials. The countless, knock-on’s, missed tackles, poor passing, illegal play and shocking kicking had nothing to do with your teams loss. If you believe that then maybe you shouldn’t follow sport. Something needs to be done urgently to stamp out this shocking behaviour. Refs are there to make the games run smoothly and to make sure the games are played fair and square. Let’s start respecting them. Let’s start teaching our future sports stars sportsmanship. Let’s do it for enjoyment.